This lecture/ performance featured Dutch theorist Eric Kluitenberg as the lecturer and artist Arthur Elsenaar as the live subject. 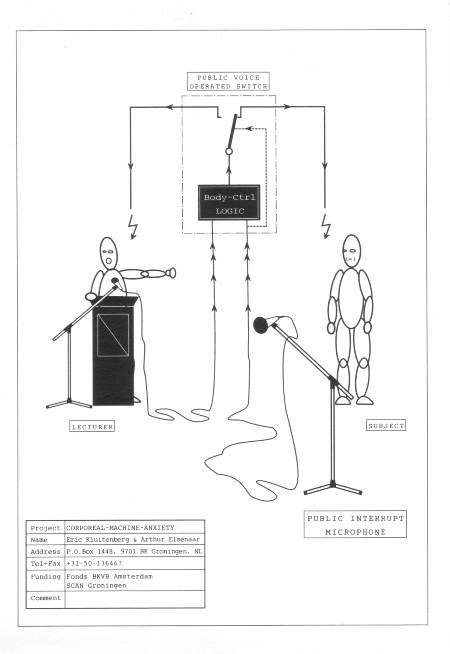 In the setup Kluitenberg’s increasingly wild statements about the corporeal machine (anxiety) were picked up by a microphone and fed directly to Elsenaar’s body by means of increasingly intense electrical stimulation. This early 1994 lecture/ performance presented at the 5th International Symposium on Electronic Art, a precursor to the later Huge Harry performance series, partly failed because the setup turned out to be too complicated. Kluitenberg himself was about to be replaced by a machine.. The Technologization of the Human Body. The human being likes to consider itself as a cultural and spiritual entity, removed from the rest of nature. This ‘split personality’ is reflected in the dualist perception of the universe that can e associated with Descartian philosophy and its followers. It clearly differentiates the realm of the physical and spiritual from each other. What however inescapably links human beings with their natural environment is their physical body. As the Cartesian program progressed it became increasingly clear that the physical and spiritual could not be separated from each other as clearly as expected. In the Cartesian tradition nature, and for that matter also animal-life, was considered as a gigantic mechanical system. Consequently the human body also became to be seen as a machine. But here an odd twist occurred. As it became clear that much of our psychological performance depended on our physical state (the body: a machine), then our psychological states should be considered the result of the states of that machine and its intricate mechanisms. This idea, scorned when first proposed, served perfectly to legitimate a liberal ideology that would enhance the technologization of human life through the industrialization of the 18th and 19th century. At the same time the model cleared the way for an unsurpassed growth of medical research and discoveries. At present medical technology has advanced to a degree where we seem to be insight of the ultimate aim of the Cartesian program: seeing all, knowing all, realizing all. The body can be (genetically) constructed and deconstructed in almost every conceivable direction. At the same time the body is immersed in an increasingly technologized environment. This ruthless invasion of the body scares many people, but it is left largely unquestioned at the conceptual level.